It really would have made more sense if it had been Clark's forces attacking and not some random space-faring Mongol Horde, but this was still a good ep. I personally love "break-the-mold" type eps, and while this one isn't as good as, say, Intersections in Real Time (or, to jump shows, Hush), it was still a fine example of the type. It really would have made more sense if it had been Clark's forces attacking and not some random space-faring Mongol Horde, but this was still a good ep. Not really. 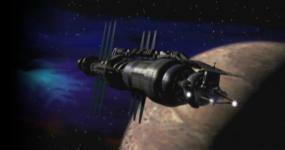 Clarke was already dead, and Lochley was already assigned as Earthforce's representative on the station. I think I recall hearing that those raiders were supposed to be someone we know, or were supposed to be someone we were to come to know or something. I actually liked how the invasion made no sense. What must of the normal people of the galaxy thought about the Shadow war and the Vorlon war? Here I go again, not quite remembering everything about the epidose, here. Why exactly was the raid something that made no sense? Well, because it was someone that threatened the station with some pretty heavy resources, but, we don't know them, and they never came up again. So, it's because it's a one off enemy with no motivation that we never heard from again or before. So, in the context of Mack and Bo, not being in the know it made perfect sense, but, for the viewer, it did seem random. The episode was originally intended for Season 4, before the end of Clarke's regime, and the attack would've exploited a supposed weakness - possibly the Minbari Civil War and the lack of Delenn's forces surounding the station. That is to say, that was intent before the demise of PTEN, and the associated requirement to get to a satisfying series conclusion by the end of S4. I still don't get what's so totally unbelieveable about getting only one glimpse at this race. They obviously weren't too interested in mixing with other races, and they got their pants kicked in the fight. So they didn't bug B5 anymore. At least not in any episode we get to see.